Start creating invoices in less than 5 seconds. While we set up your account, please remember to verify your account by clicking on the link we sent to your registered email address. Leave a lasting impression on your customers. 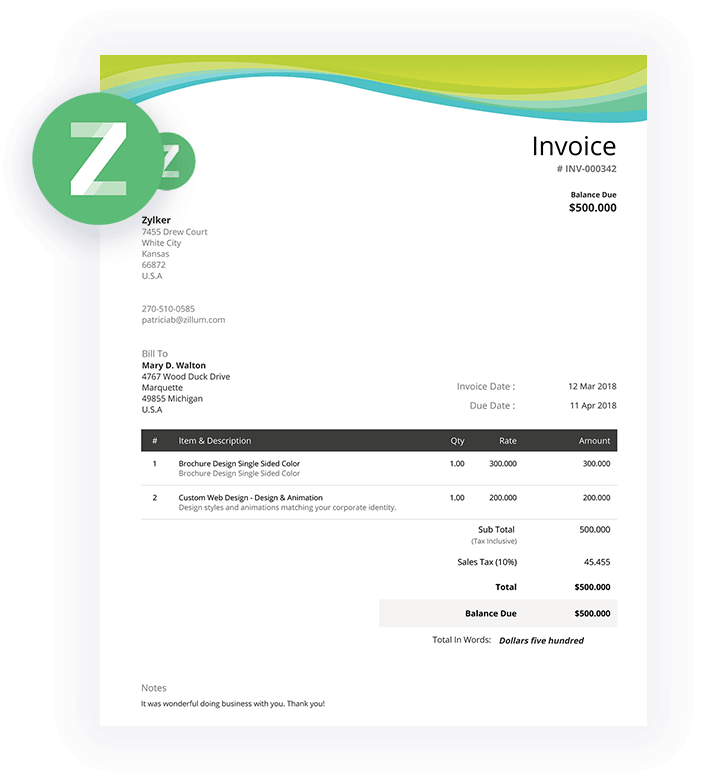 Use invoice templates from Zoho Invoice to create and send personalized invoices to your clients. With a wide range of templates invoice templates, you can choose a template that resonates with your brand and customize it to your liking. Send invoices to your customer the moment you create it or download the invoice PDF. Receive payments online by integrating with a payment gateway of your choice. Customize your invoices with a personal touch. Add your organization's logo or any image of your choice to an invoice, then spice it up with a killer color scheme. 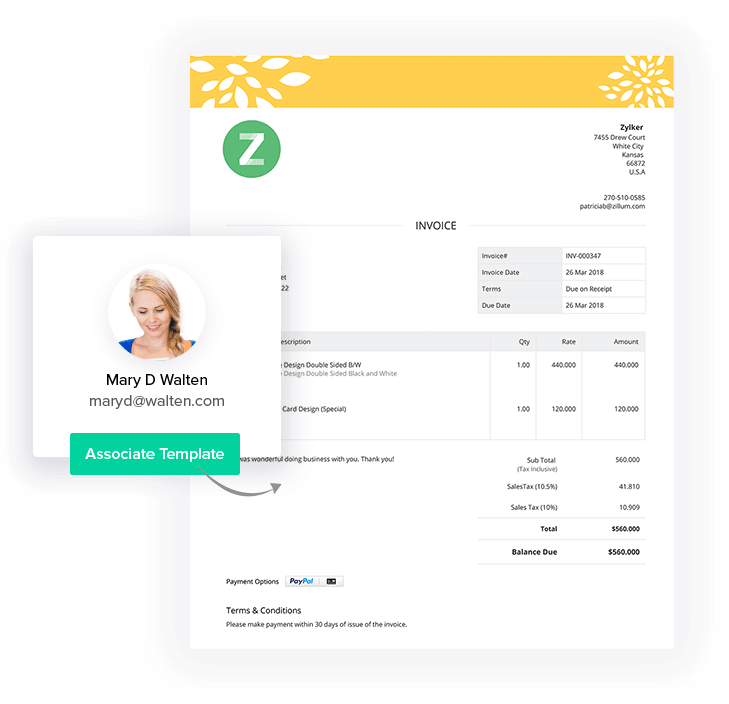 Zoho Invoice gives you complete freedom over your templates. Craft your invoice to look both professional and beautiful. Rename labels, arrange columns, create custom fields and fine tune placements to make your invoice perfect. You can edit our existing stock templates or create new new ones to suit your needs. Custom tailor each invoice to be client-specific. 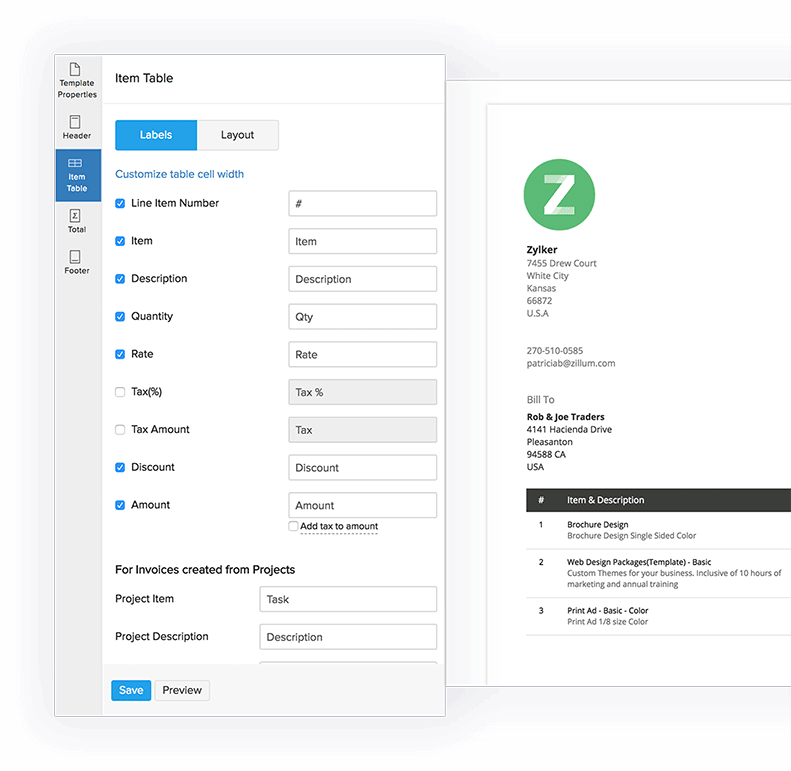 Zoho Invoice lets you map a template to every contact, allowing you to apply a personal touch to every step of the sales process. 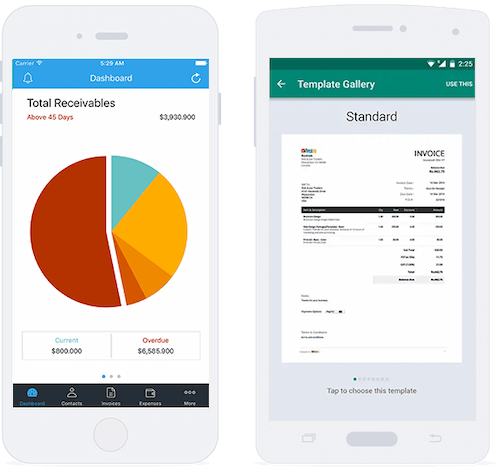 Zoho Invoice makes tax easy. 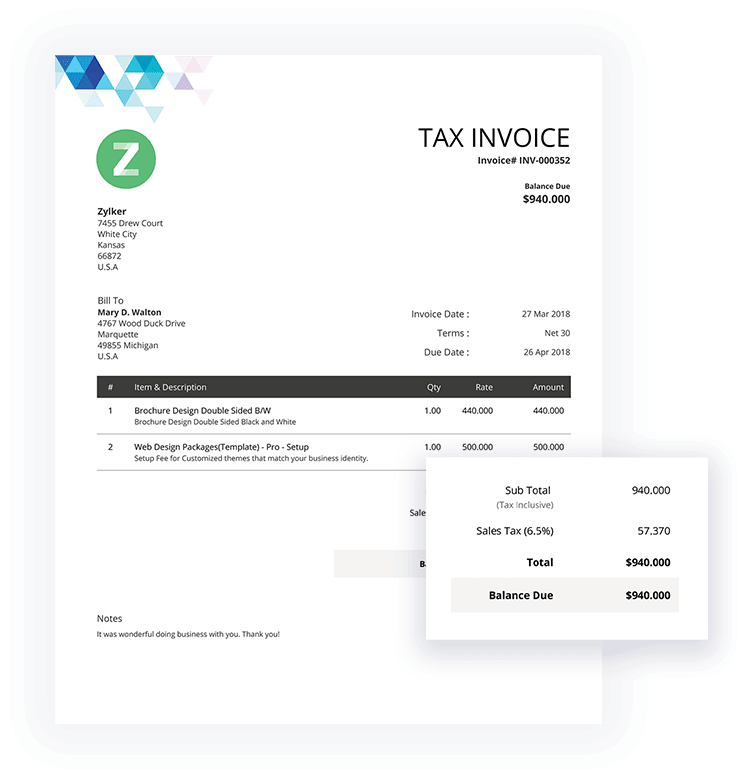 With tax invoice templates, you can capture all the adequate tax related information and give your customers a neat breakdown of the exact taxes charged on them. Our gallery offers a variety of templates to choose from. Pick a template, choose the language you prefer and start invoicing right away. 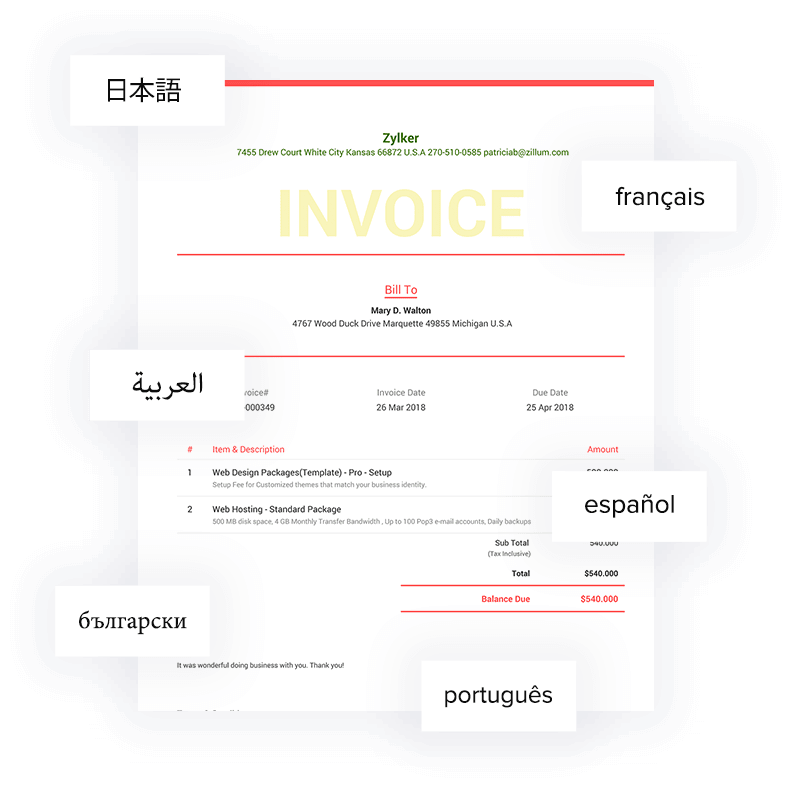 Multi-lingual support lets you create invoices in each of your customers' languages. Choose your favorite theme from our gallery of ready made invoice templates and give it a touch of your creativity or use it as it is. Either way, our invoices are quick and easy to fill. Not all countries have the same invoice requisites. With Zoho Invoice, you can rest assured that your invoice is compliant with your country's tax rules and layout requirements. Following are some of the country specific changes employed in Zoho Invoice. according to the user's device. Zoho is trusted by 35 million users around the world. ​"It has a simple interface and is easy to use. I found all the features that I needed to make my invoicing a breeze. I had a few questions, which I got answered immediately through chat support." 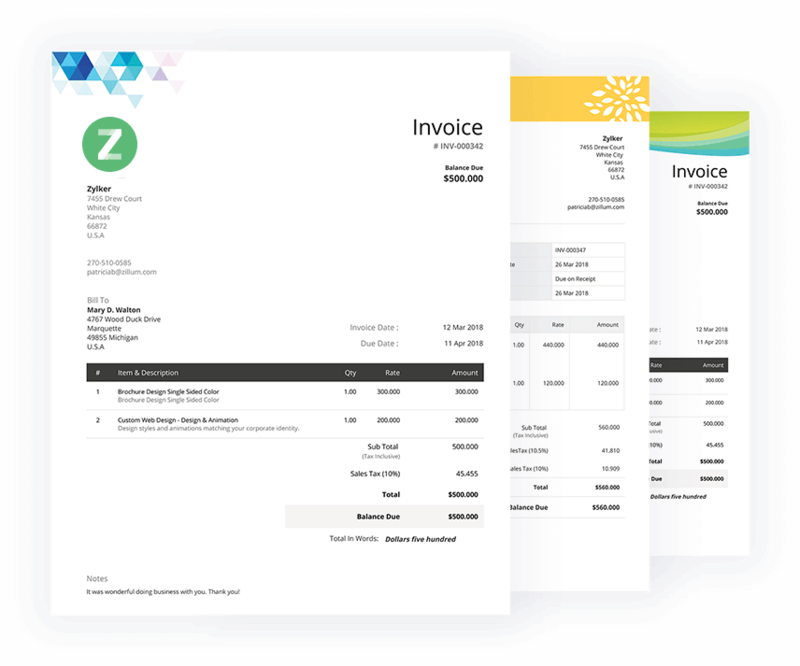 Find out what makes Zoho Invoice the best invoice software and a simple invoice solution.